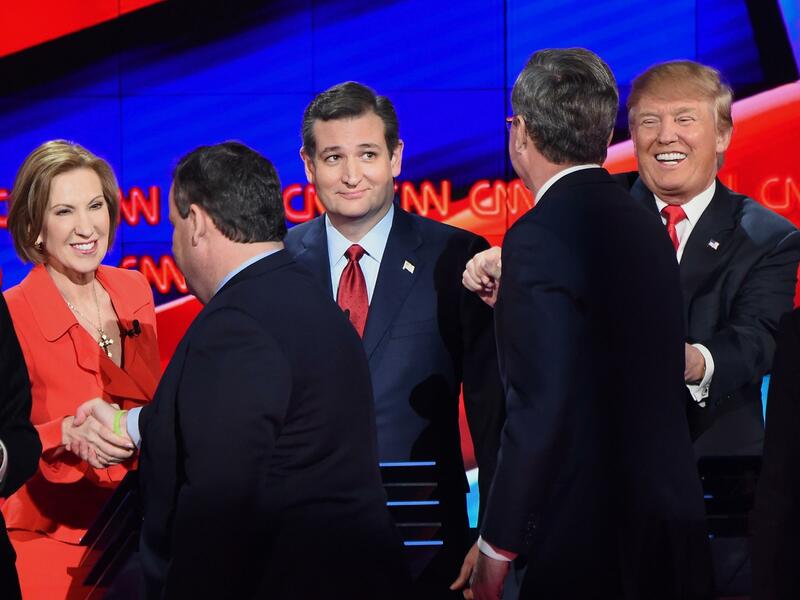 Republican presidential candidates (from left) Carly Fiorina, Chris Christie, Ted Cruz, Jeb Bush and Donald Trump interact onstage at the end of the Republican Presidential Debate on Dec. 15. Now that we've all had a wonderful time over the holidays, we can begin thinking about the election. Let me begin by saying that there are few things more exciting to me than an election year. Back in the day, I'd be headed for Iowa or maybe New Hampshire about now. Because coming right up are the first real judgments by real people. Over several months, we get to hear what ought to happen from our fellow Americans in states in all parts of the country — in places very different from Iowa and New Hampshire. A highlight for me is the Wisconsin primary in April, where all the candidates from all the parties are on one open primary ballot. People can vote for whoever they want. Wisconsin sometimes hands us a big hint about what's going to happen. In 2008, Wisconsin voters told me Barack Obama would win. And in June, California votes. Some election years, it seems all over by June. But California is fascinating anyway. That state brings out every kind of voter, and again, offers big hints about which groups are excited about what. Then, a summer breather ... and on to the conventions. In the past few decades, they've been mostly boring. There have been only a few bits of excitement, over good and bad and terrible choices of vice presidents, or tension over whether the big nets filled with balloons will release their colorful cargo. This year, the Republicans may do something more interesting — a contested convention. It's hard to believe a contested convention is even possible, given the rigid and complicated rules. But if Mr. Trump and company manage to shake up the convention, as they have the run up to the election year, we could see some fireworks. More than one ballot? A walkout? A third party? Although the Democrats have barely begun to fight as the year opens, their nomination battle promises to be historic. If Mrs. Clinton is the nominee, women all over the country will be telling each other that they will not vote for her just because she's a woman. Or, they will. Recent history tells us I'm making this sound more interesting and exciting than it possibly will be. Maybe so, but there is no way to make it sound more important than it is. We're looking at an election year, and it's huge. Now that we've all had a wonderful time over the holidays, we can begin thinking about the election. Let me start by saying there are few things more exciting to me than an election year. Back in the day, I'd be headed for Iowa or maybe New Hampshire about now because coming right up are the first real judgments by real people. Then spread that out over months and we get to hear what ought to happen from our fellow Americans in states in all parts of the country, in places very different from Iowa and New Hampshire. A highlight for me is the Wisconsin primary in April where all the candidates from all the parties are on one open primary ballot, and you can vote for whoever you want. Some years, Wisconsin hands us a big hint about what's going to happen. In 2008, Wisconsin voters told me that candidate Obama would be president. And in June, California votes. Some election years it seems all over by June, but California is still fascinating. That state brings out every kind of voter you can think of, and again, offers big hints about which groups are excited about what. Then a summer breather and onto the conventions. In the last few decades, they've been mostly boring with a few bits of excitement over good, bad and terrible choices of vice presidents or tension over whether the big nets filled with balloons will release their red, white and blue cargo. This year, the Republicans may do something more interesting. Hard to believe that a contested convention is even possible given the rigid and complicated rules. But if Mr. Trump and company manage to shake up the convention as they have the run-up to the election year, we could see some fireworks, more than one ballot, a walkout, a third party. And although the Democrats have barely begun to fight as the year opens, their nomination battle promises to make history. And if Mrs. Clinton is the nominee, women all over the country will be telling each other that they will not vote for her just because she's a woman, or maybe they will. Recent history tells us that I'm making this sound more interesting and exciting than it possibly will be. Maybe so, but there is no way to make it sound more important than it is. We're looking at an election year and it's huge. Transcript provided by NPR, Copyright NPR.